Dark gums, or black gums as they are sometimes called, have a variety of causes and there a number of things that can cause this condition to arise. Many are benign and/or yield readily to treatment. In a couple instances, however, the underlying cause is more serious. A better understanding of dark gums can help patients determine if they should talk to a professional immediately upon noticing the condition or wait until their next regularly scheduled dental checkup. The first thing to understand is that body tissues, the gums included, derive their color from the presence of melanin, and the amount of melanin varies from one person to the next. If the individual has a lot of melanin, he or she may well have gums that are darker than average, and that’s natural for him or her. In other words, if the person has always had dark gums, there’s no reason for alarm simply because he or she has recently learned that, in some people, dark gums indicate an underlying medical condition. Generally speaking, though, if the color of the gums changes over a short period of time, or if black spots appear on the gums, the body’s natural production of melanin in and of itself is probably not responsible. Smoking can produce black gums. This is a condition called smoker’s melanosis. The nicotine in the smoker’s tobacco causes melanocytes, the cells in the body that make melanin, to make more than normal. When this happens, the darkening can appear in patches or affect the entire interior of the mouth. It can also discolor the cheeks and lower lip. Research suggests that in some cases, quitting smoking can reverse the discoloration. Certain medication can also produce dark gums. One example is minocycline, used to treat acne and some infections. Minocycline sometimes produces discoloration, although this is an uncommon side effect, and sometimes the discoloration happens in the mouth. Other treatments with similar potential side effects are antimalarial agents, tricyclic antidepressants, and metal-based fillings or crowns. As with any side effect, patients experiencing this one should discuss it with their physicians. Alternative medications may be available. The gums are susceptible to bruising like other parts of the body. An individual can bruise them by getting hit with something, bumping into something, falling down, eating something with a sharp edge, or even flossing or brushing his or her teeth too hard. In such instances, there may well be some minor discomfort and bleeding in addition to the bruising. Bruises generally heal up fine all on their own and are not cause for concern. If a person keeps developing them, though, and can’t figure out why, it’s wise to consult a doctor. The patient may have thrombocytopenia, a condition in which the blood doesn’t clot as readily as it should, and if so, that will require treatment. Children sometimes develop dark gums due to an eruption hematoma. This can happen when either a baby or permanent tooth is about to come in. This creates a cyst filled with fluid, and if there’s blood in the fluid, that darkens the gum. The blood is typically present when an impact injures the eruption cyst. Like simple bruising, an eruption hematoma usually clears up by itself after the tooth comes in. If the tooth doesn’t come in on its own, a physician can surgically open the cyst to let it through. Amalgam is a substance dentists use to fill cavities. Sometimes the process leaves a stray bit of amalgam on the gum and creates a dark spot known as an amalgam tattoo. 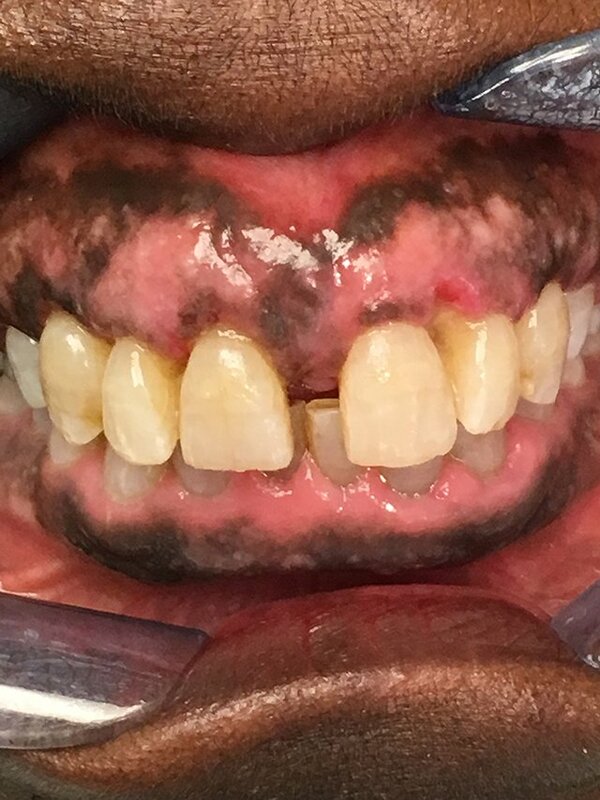 If this is the cause of an individual’s dark gums, a knowledgeable professional will usually be able to tell just by looking at the discoloration. Amalgam tattoos aren’t removable, but fortunately, they aren’t harmful, either, and don’t require treatment. Dentists can prevent them by using rubber dams when they place fillings. The dam provides a barrier between the tooth and gum that keeps amalgam from migrating from the former to the latter. A blue nevus is a round mole that can be either flat or slightly raised. They can be either blue or black and look like freckles on the gum. Blue nevi tend to develop during adolescence and are more common in women. No one knows what causes blue nevi, but, like amalgam tattoos, they’re readily identifiable and generally harmless. If they change color, shape, or size, though, a doctor may recommend a biopsy to check for cancer. Melanotic macules look like freckles, too. They can appear on various parts of the body, the gums included, and are generally between one and eight millimeters in diameter. A person can be born with them, or they can appear later in life. Like blue nevi, they’re generally harmless although they can be one symptom of Addison’s disease, Peutz-Jeghers syndrome, or certain other diseases, and if they change in appearance, a doctor may see fit to biopsy them, once again to test for the presence of cancer. Sometimes a rare condition called oral melanoacanthona causes dark spots to appear in various portions of the mouth, the gums included. This is another condition whose cause is not yet understood although doctors have determined it occurs mostly in younger people. It may be due to injuries sustained while chewing or due to friction. Whatever the cause, no treatment is required. Oral cancer can produce dark gums. It often produces bleeding, open sores, and swelling in the mouth as well. Cancer in the mouth can also result in an altered voice, a chronic sore throat, or the changes in a mole or freckle mentioned above. Doctors generally detect oral cancer by means of a biopsy. They may also employ a CT scan or PET scan to determine if the cancer has spread. 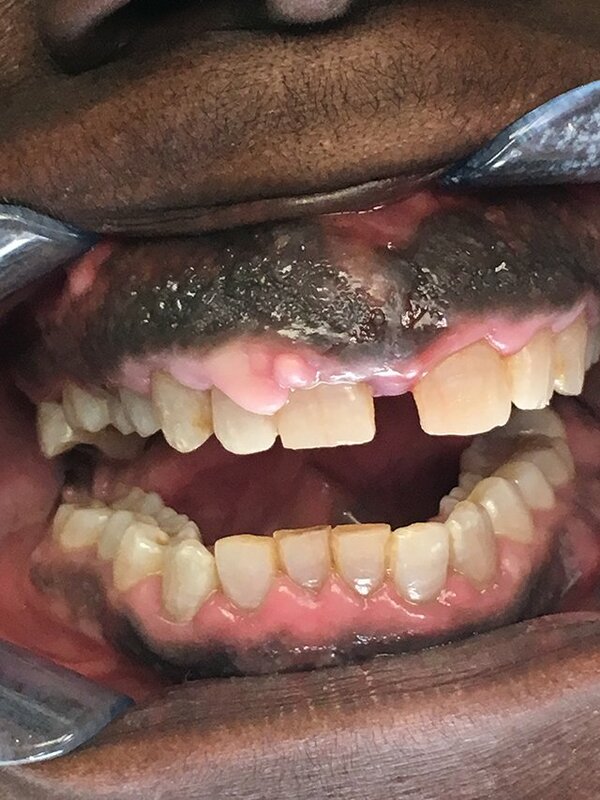 Dark gums can also result from acute necrotizing ulcerative gingivitis. This is a condition rarely seen today although it was common enough on the battlefields of World War I to acquire the name trench mouth. It causes a gray film to build up on the gums as the tissue dies. It can also cause fever, gum pain, and bad breath. Trench mouth occurs when there’s a rapid growth of bacteria in the mouth, usually as a result of gingivitis. The bacteria may build up due to an unhealthy diet, poor oral hygiene, stress, and/or insufficient sleep. Early symptoms include bad breath, bleeding gums, an excessive amount of saliva, ulcers on the gums at the edges of the teeth, and a general feeling of illness. Dark gums can also result from acute necrotizing periodontal disease, sometimes called black gum disease. In this illness, the discolored gums likewise reflect the presence of dead tissue, or necrosis. Black gum disease may also cause pain that comes on rapidly, spontaneous bleeding, bad breath, and gum tissue that appears blunted between the teeth as opposed to the conical shape visible in healthy gums. The illness is often related to poor nutrition, stress, smoking, and viral infections like HIV. This condition has spread to the supporting bone around the teeth. Addison’s disease is an illness of the adrenal glands which produce a number of hormones. This disease prevents the adrenal glands from producing sufficient quantities of hormones. More often than not, Addison’s disease is an immune disorder. The immune system itself is attacking the adrenal glands. Early warning signs include fatigue, excessive thirst, poor appetite, weight loss, and weakness. The dark gums (and lips) manifest somewhat later on due to a process called hyperpigmentation. Dark patches can develop on parts of the skin as well. Discolorations around scars, in the lines on the palms, and on the knees and knuckles are common. Addison’s disease can become extremely serious if it goes untreated. It can bring on an adrenal crisis, the symptoms of which may include dehydration, drowsiness, pale, clammy skin, drowsiness, and fast, shallow breathing. An adrenal crisis constitutes a medical emergency. Peutz-Jeghers syndrome is a genetic condition that increases the risk of polyps or cancer. An early symptom is the development of dark brown or dark blue freckles that can appear in the mouth as well as on the fingers and toes. They typically appear in childhood and disappear with age. Another symptom is blockage or bleeding in the gut. This too generally happens in childhood. If a doctor suspects the presence of Peutz-Jeghers syndrome, genetic testing can determine this for certain. To get answers to your questions about treating dark gums and how you can take better care of your teeth and gums, contact us today.